NASA Announces LIFE on Mars – More Disclosure? The “building blocks” for life have been discovered in 3-billion-year-old organic matter on Mars, NASA scientists announced Thursday. The Neo Darwinist’s must be really happy this morning as “life” from the Red Planet has been discovered! Not so fast Citizen! They haven’t actually found life on Mars. Here’s what the article says. Researchers cannot yet say whether their discovery stems from life or a more mundane geological process. 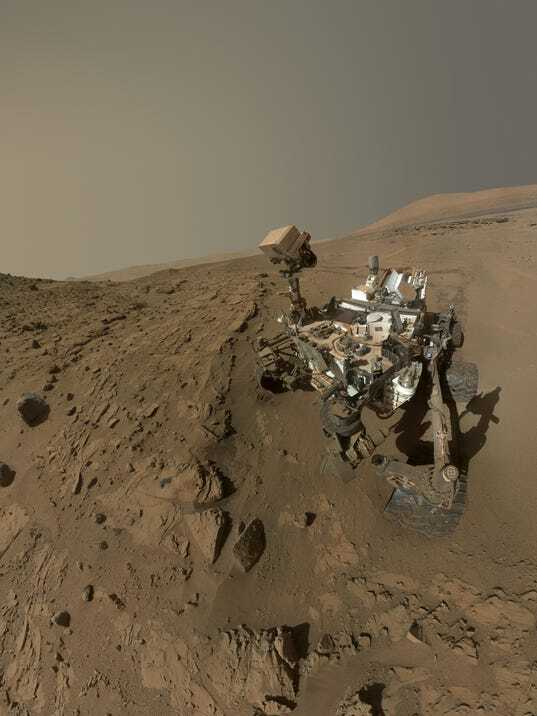 However, “we’re in a really good position to move forward looking for signs of life,” said Jennifer Eigenbrode, a NASA biogeochemist and lead author of a study published Thursday in the peer-reviewed journal Science. When you have an agenda to push the truth really doesn’t matter, does it? When there is no God in your world-view stories like this create the illusion that the Big Bang is true, that the Universe and life here on earth happened by chance. There is no God, no supernatural world, no sin, no moral absolutes. It all comes down to this: Do what you want to do! But as we can plainly read in the article, no life was actually discovered on Mars. If we are intellectually honest, no one knows what this is and where we are in it. If the universe is analogous to the USA are we in Duluth, Tampa or Walla Walla? No one knows. This fact alone should keep most of us up at night. I am a biblical literalist. In the Bible, we read this. To the Darwinist, the above scripture is nonsense, the stuff of mythos and lunatics made it all up for money and control. However, to the spirit filled born again Christian, this scripture is packed with information that lets us know He. Jesus, created us. He also died for us to redeem us to Himself. To sum it up. The above article is yet another step toward disclosure of so-called extraterrestrial life. Have you seen our film In their Own Words – UFOs Are Real? In it, we discuss the Darwinian paradigm and how disclosure is imminent. Here’s a clip that discusses this. Get Informed! We only have their word for it, L.A. that they are even on Mars. NASA habitually lies and has proven fraudulent, over and over again. Personally, I don’t believe they can get through the Van Allen radiation belt. L.A. I believe in the gap theory were there is an unknown amount of time between Gen. 1:1 and Gen. 1:2. In verse 2 the word “was” could also be translated “became” (this is a footnote in my bible NIV) meaning the earth was not “formless and empty” prior to G-d “hovering over the waters.” Mars likewise could have had an atmosphere with vegetation on it in the past, providing crude oil underground for man to use in the future, maybe during the minillium. Just a thought I had, not that I am dogmatic about it but I would not be surprised at anything G-d may have done in the past to lay up treasures for his created man.